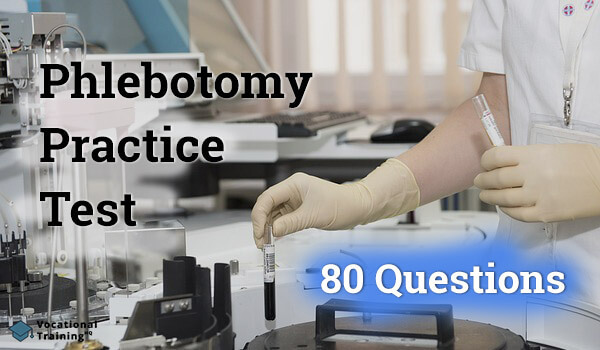 Phlebotomy Practice Test: Get Ready for Your Phlebotomy Exam! The Certified Phlebotomy Technician exam covers the following topics: patient preparation, collection techniques, processing and safety, and compliance considerations. This exam masters future phlebotomists’ confidence in their skills and abilities and helps them acquire a CPT (phlebotomy certification) that will improve their healthcare career. Erythrocytes, known as red blood cells transport oxygen and carbon dioxide. The arterial blood vessels carry oxygenated blood from the heart to the body tissues. Median cubital, basalmic, and radial veins. Antecubital fossa, median cubital and cephalic veins. Cephalic, median cubital and basilic veins. Antecubital, median cubital and basilic veins. The cephalic, median cubital and basilic veins are the three most common arm veins used in phlebotomy. The bend of the elbow, the front of the arm. The bend of the elbow, back of the arm. The bend of the elbow, the outer side of the arm. The bend of the elbow, the inner side of the arm. The antecubital fossa is located at the bend of the elbow, on the front side of the arm. Basophils is a white blood cell responsible for an allergic reaction in case of allergen invasion. The liver is the body’s largest filter, and part of both the circulatory and digestive systems. The nervous system detects changes to the internal and external environments of the body and directs or coordinates a response. The respiratory system's primary function is air-supply and it also contains cilia, hair-like structures that function as tiny filters. The fibrinogen is contained in the blood plasma. Nephrons in the kidneys filter blood, draining the waste products into the floor of the kidney, ureters drain the urine from the kidneys into the bladder, and the urethra drains the bladder, passing urine outside of the body. Nephrons in the kidneys filter blood, draining the waste products into the floor of the kidney, the urethra drains the urine from the kidneys into the bladder, and the ureters drain the bladder passing urine outside of the body. The bladder produces urine from the ureters; the urethra drains the bladder of urine to outside the body. The pathway involved for formation and excretion of urine involves nephrons in the kidneys filter blood, draining the waste products into the floor of the kidney, ureters drain the urine from the kidneys into the bladder, and the urethra drains the bladder, passing urine outside of the body. Petechiae- indicating possible excessive bleeding after blood collection. Measles- indicating possible infectious disease exposure. Psoriasis- indicating a possible skin disorder and should be avoided as a potential venipuncture site. If pinpoint red dots appear on the body, this phenomenon is known as petechiae, indicating possible excessive bleeding after blood collection. A phlebotomy tech is about to collect a blood specimen from a patient and during the examination of the patient's arm for a potential site, the tech notices the presence of petechiae on both patient's arms. The tech understands the meaning of this and thus, they proceed with the venipuncture and allow extra time to assure themselves that the bleeding has stopped before they leave the patient. Why did the tech do this? Petechiae indicate possible clotting problems. Petechia indicates possible blood pressure problems. Petechia indicates possible infectious disease. Petechia indicates possible areas of inflammation. The phlebotomy tech knows that the petechiae indicate possible clotting problems. Which of the following is not something that the phlebotomists should consider when working with older adults? When working with older adults, the phlebotomists should provide a protective environment. Accurately monitoring the total volume of withdrawn blood. Using protective restraints where necessary. Regarding working with newborns, protective restraints should be used where necessary. A container of ice water. The tech has forgotten a container of ice water. Hypovolemic shock is a medical emergency. Fainting is a medical emergency. Fainting may be caused by an emotional reaction or pain. Fainting is not a medical emergency while hypovolemic shock is. These precautions will help prevent hemolysis of the specimen. The tech should avoid the right arm. The tech should keep the patient in a flat position. There are no special precautions for this situation. Drawing blood from an arm on the same side as a mastectomy may result in infection for the patient and invalid or inaccurate test results. The symptoms of latex allergy are skin redness, hives, shortness of breath, runny nose and watery eyes. The phlebotomy tech collects a blood specimen of a patient that has returned from a radiology test that included an IV injection of dye. The tech notes the radiographic test and time on the requisition form. Why did the tech do this? In order to inform the lab of possible adulterants. In order to inform the lab of a procedure that may affect the blood test. In order to inform the lab of other departments involved in the patients' care. In order to inform the lab of possible time delays. The tech noted on the form the name and time of the radiographic procedure because the IV dye may interfere with the blood test. The appropriate time for labeling a patient specimen is immediately after collection. To inform the patient of the procedure, which is required for informed consent. The tech explained the procedure in order to get implied consent from the patient. To prepare the patient for the pain they may feel, so as not to surprise them. The tech is informing the patient of the procedure, which is required for informed consent. The phlebotomy tech needs to call the nursing station to inform the nursing staff of an elevated lab result of a patient. The tech is tentative to do so because he believes it may be a breach of confidentiality. Is the tech correct? The tech is not correct because sharing clinically significant information with members of the healthcare team is not a breach of confidentiality. The phlebotomy tech is in a room with a patient and several of his visitors. He needs to perform another blood draw. The tech introduced themselves and identified the patient and then congratulated the patient saying that the patient's previous blood draw confirmed that the patient is pregnant. Has the tech done anything wrong and if he did, what? The tech has not done anything wrong. The tech has breached the patient’s right to confidentiality. The tech has violated the Patient Bill of Rights. The has breached the patient’s right to confidentiality and violated the Patient Bill of Rights. Handcuffs used to control people who are arrested. The process an arrested person follows when in jail. The order of laboratory supervisors alike the chain of command. The process for maintaining control of a specimen, from the actual collection to final disposition, used under special circumstances such as workplace, sports, or law enforcement testing. Chain of custody is the process for maintaining control of a specimen, from the actual collection to final disposition, used under special circumstances such as workplace, sports, or law enforcement testing. The phlebotomy tech is performing his working tasks in the outpatient lab. A patient came in for a drug screening of urine. The tech put a tamper-proof urine collection cup in the bathroom designated for drug screening. After the tech has received the patient's urine, he had examined its color and noted the temperature. The tech also noted the observations and initiated the chain of custody form. Why did the tech examine the color and temperature of the urine sample? The tech checked for evidence of tampering. The tech checked for signs of dehydration. The tech wanted to determine if drugs are present. The name of this amendment is the Clinical Laboratory Improvement Amendment. Right patient, right specimen, right tube, right test, right label. Non-clotted specimen (when an anticoagulant additive is used). Specimen transported to a lab within two hours of collection. Specimen transported to a lab within two hours of collection. is not considered a requirement for a quality specimen. The tech uses non-verbal communication and friendly professionalism. What is the purpose of an incident report? For the tech to get their story in before the patient does. For the tech to report an incident. For the tech to tell on a co-worker anonymously. For the tech to admit wrongdoing in writing. The incident report is for the tech to report an incident if any. Which department has a clinical chemistry lab? The clinical chemistry lab is in the department of clinical pathology. Arterial blood is the blood that flows towards the body tissues and contains oxygenated blood cells. Homeostasis is the process in which the human body attempts to maintain internal stability in response to stimuli disturbing its normal condition. What is the meaning of the word part blephar/o ? The word part blephar/o means eyelid. What is the meaning of the word buccal? What is the meaning of the word phlebitis? Phlebitis is an inflammation of the veins. Which of the following medical word roots which contain -rrh means "t burst forth"? What is the meaning of the word-part "hemat/o"? The word part "hemat/o" means blood. The pathologist is the laboratory professional has extensive training in both clinical and anatomical laboratory interpretations and has a medical degree. Guidelines designed to prevent transmission of infection from any source of body fluid, except sweat, in healthcare settings. Guidelines designed to prevent transmission of infection by blood and body fluids in healthcare settings. Guidelines designed to prevent transmission of infection by a known source of infection. Transmission-based precautions are guidelines designed to prevent transmission of infection by a known source of infection. Is a splash-proof face shield necessary to enter a contact isolation room? A splash-proof face shield is necessary to enter a contact isolation room. A route of pathogenic transmission, from one host to another. A method of transmitting information. The mode of transmission is the route a pathogen requires for transmission from one host to another. The Hazard Communication Standard complies with properly labeled chemical containers. "All equipment that contains needles must have a system to single-handedly permanently resheath the needle.” is a federal requirement of healthcare employers. Yellow indicates a reactivity/stability hazard. The number 4 indicates no hazard. Yellow indicates a reactivity/stability hazard. The number 4 indicates an extreme hazard. Yellow indicates a special hazard. The number 4 indicates a moderate hazard. Yellow indicates a flammability hazard. The number 4 indicates a mild hazard. The yellow diamond with the number 4 indicates reactivity/ extreme stability hazard. A mild blood borne hazard. A moderate blood borne hazard. A red diamond with a number 1 indicates a mild flammability hazard. An infectious agent in the liver. A liver disease that can lead to cirrhosis or cancer. Hepatitis is a liver infection that is caused by a virus. This virus can be one of several different serotypes and can lead to cirrhosis or cancer of the liver in susceptible patients. A health care worker should not shake hands with a patient with HIV. HIV is easier to contract than Hepatitis. HIV is a disease state caused by the virus AIDS. HIV is a blood-borne pathogen that can be spread through blood and body fluids. Why are asepsis procedures are necessary? Patient care areas are sterile. They lower the risk of spreading infection. Asepsis procedures are necessary because they lower the risk of spreading infection. What are needle-stick protection devices? Caps for needles that reduce the risk for needle-sticks. Needle-stick protection devices are caps for needles that reduce the risk for needle-sticks, engineer controls for safety and they are Required by law. Homeostasis is the process through which the human body attempts to maintain internal stability in response to stimuli disturbing its normal condition. The phlebotomy tech is about to perform venipuncture so they are selecting a vein. He assured himself that he found the right vein after applying a tourniquet, and palpating the vein. The selected vein feels big and it is cord-like. Is this vein the right choice? Veins that feel cord-like are thrombosed. The test in which alcohol wipes shouldn't be used when drawing samples are the ETOH level and blood cultures. Red top, yellow top, light blue top, additive tubes. Light blue top, red top, additive tubes. Yellow top, light blue top, red top, additive tubes. Yellow top, light blue top, red top, additive tubes is the proper order of draws. The phlebotomy tech is collecting blood from a finger-stick. They are worried that have insufficient blood drops and that they might have to re-stick the patient. The tech squeezes and milks the fingertip by squeezing a few more drops of blood. What (if anything) did the new phlebotomy tech do wrong, and why? The tech did not do anything wrong. The tech should not milk the site as milking hurts the patient more than a re-stick. The tech should not squeeze and milk the site because fluid from the fingertip tissue may be squeezed into the blood drops. The tech contaminated the site and sample by squeezing and milking. What is the purpose of ARD and what does it stand for? "Antibiotic recovery device," used when testing for appropriate antibiotic therapy. "Account receivable department," used for billing purposes. ARD stands for "Antibiotic removal device," used when blood cultures are drawn after the patient has received antibiotics. A phlebotomy tech drew for multiple tests: a CBC, PT & PTT, blood glucose level and thyroid panel. He recalled from the class that collection tubes are drawn in order. The tech arranged the collection tubes in this order: lavender top, light blue top, gray top, and SST/ tiger top. What did the tech do wrong? The tech used too many tubes. The tech didn't follow the order of draws. The correct order is light blue top, SST/tiger top, lavender top, and gray top. The tech didn't follow the order of draws. The correct order is SST/tiger top, light blue top, lavender top, and gray top. The tech didn't follow the order of draws. Correct order is: light blue top, SST/tiger top, lavender top, and gray top. It is the same tube but a different name. The order of draw does not apply. The SST is first in the order of draws. Lavender or purple-topped collection tubes indicate the additive EDTA in the content. The phlebotomy tech entered the patient and greeted him by saying "Hi, I am the phlebotomy tech and I will draw a little blood. Are you Mr.Jack? What, if anything, has the tech done wrong? The tech should allow the patient to say his name first. The tech shouldn't speak so casually to the patient. The tech should allow the patient to say his name in order to verify the identity of his patient. When using micro-containers, drawing samples should be in the following order so that additive cross-contamination will be prevented: hematology, chemistry studies, and blood bank. The phlebotomy tech is performing a heel puncture and is inspecting an infant's heel for an appropriate puncture site. The tech holds the infant's heel and imagines a V-shaped boundary line, with the point at the back of the heel. The tech chooses his puncture site on the left side of the heel, on the outside of the V-shaped boundary line. What, if anything, has the tech done wrong? The tech should have chosen a site inside the V-shaped boundary. The tech should have inverted the V-shaped boundary line. The tech should have used a circle-shaped boundary line. The tech didn't do anything wrong. The tech didn't do anything wrong because choosing a puncture site outside of the V-shaped boundary keeps the puncture site options contained to a safer area. Serum contains proteins and no clotting factors while plasma contains serum and clotting factors. Serum contains clotting factors while plasma contains serum and proteins. Serum and plasma contain clotting factors. The serum also contains proteins while the plasma also contains lymph fluid. The difference is that the serum contains proteins and no clotting factors while plasma contains serum and clotting factors. he additive used to preserve glucose in blood. The destruction of red blood cells. The process of breaking down glucose for energy. Glycolysis is the process of breaking down glucose for energy. The phlebotomy tech has a stat drew and enters a patient's room where the patient and the doctor are discussing. The tech immediately leaves the room, respecting the patients’ right to privacy. He plans to return after completing a routine draw from the patient across the hall. What, if anything, did the tech do wrong? Because it was a stat draw, the tech should interrupt the discussion by informing the physician an important stat draw is due, and draw the sample. The tech should introduce himself, explain to the patient and physician why he is in the room, and follow-up by asking if he may draw the specimen. The tech should stand quietly in the room until the discussion is over and then draw the specimen. After introducing himself, the tech should explain to the physician and patient why are they in the room and ask permission to begin the procedure. The phlebotomy tech is preparing to perform an arterial puncture. Please mark the area of the patient’s body that should be examined first for a suitable site? The antecubital area of both arms. The thumb side of the wrist. The thumb side of the wrist should be examined first. The phlebotomy tech is observing another tech's technique while they perform an arterial puncture. One of the most striking differences the tech observes is the angle of the needle their colleague is using. The colleague-tech has inserted the needle at a 45-degree angle. Is the colleague-tech demonstrating proper technique? The tech is demonstrating the proper angle for an arterial puncture. The phlebotomy tech has finished one specimen collection and has thought about the stat draw he was just notified of, as well as the timed draw already scheduled on his run. After the collection tube was filled to the correct level, the tech quickly removed the needle, covered the puncture site with gauze, labeled the specimen, and left the patient's room. What, if anything, has the tech done wrong? The tech hasn't done anything wrong. The tech did not remove the tourniquet. The tech did not check the site for bleeding before leaving the room. The tech did not remove the tourniquet before removing the needle. They also didn't check the site for bleeding before leaving the patient’s room. The phlebotomy tech has selected a needle for a butterfly syringe, intended for drawing a blood specimen from a pediatric patient. The patient’s veins are small, so the tech wants a small sized needle, so he chooses a 23-gauge needle. Has the tech made the correct selection? A 23-gauge needle is a small-bore needle. The phlebotomy tech has been notified that yet another of his finger sticks has been rejected by the lab. The lab tech tells him, “Quit milking so much!” The tech is not sure what that means. Can you tell the tech what is causing rejection of his capillary collections from finger puncture? You are squeezing too hard and pulling the fingers toward the fingertip. It causes hemolysis and tissue fluid to be squeezed into the blood. You are scooping the blood with the capillary collection device, instead of letting it fill on its own. It’s causing hemolysis. Don’t pester the lab techs so much; lay low and they will quit picking on your specimens. "Milking" is the word for squeezing and pulling action used with a finger puncture. Please mark the POCT device that is the only test which not wiping the first drop of blood away, before collecting the capillary specimen? Blood coagulation monitor devices usually instruct to not wipe away the first drop of blood after a puncture for capillary blood. An intravenous infusion is not a method of blood collection. For which group of patients a 22-gauge needle would be appropriately used? A 22-gauge needle is usually used in both children and senior adults. An automatic incision device is used to make two incisions on the lower arm. There is not a disadvantage. that it lies close to the medial nerve. that is not easily palpable. The disadvantage of using the radial artery for arterial puncture is that it is smaller than other arteries. A blood sample drawn for a uric acid would be drawn in a SST and sent to the chemistry lab. What is the match if the test is A1C? A blood sample drawn for an A1C (hemoglobin A1C) is drawn in a lavender top tube and sent to the chemistry lab. The phase of laboratory testing that involves phlebotomists. The phase involving all processes of laboratory testing. The pre-analytical phase of laboratory testing is the first of the two phases that are involved in all processes of laboratory testing. The patient did not maintain the designated fasting period for a fasting sample. Light sensitive sample not protected from light.